BACKGROUND: Vitamin A deficiency is a public health problem in Zimbabwe. Addressing vitamin A deficiency has the potential to enhance resistance to disease and reduce mortality, especially in children aged <5 years. OBJECTIVE: To describe a vitamin A supplementation outreach strategy implemented in one of the remote rural districts in Zimbabwe, which increased coverage after being implemented in difficult circumstances in a remote rural region. METHODS: We implemented and adapted a vitamin A supplementation outreach strategy within the national immunisation days (NIDs) and extended programme of immunisation in a remote rural district in Zimbabwe. The strategy involved supplementating children at prescheduled outreach points once per month for the whole year. Despite usual operational challenges faced at implementation, this approach enabled the district to increase delivery of vitamin A supplements to young children in the district. RESULTS: The strategy covered 63 outreach sites, with two sites being covered per day and visited once per month for the whole year. Coverage reached 71% in an area in which previous coverage rates were around <50%. CONCLUSION: Implementing a vitamin A supplementation outreach strategy increased vitamin A supplementation coverage among children living in a remote rural region. This strategy can potentially be used by Scaling Up Nutrition (SUN) member states. However, we recommend further exploration of this strategy by others working in similar circumstances. In developing countries it is estimated that deficiencies in iron, zinc and vitamin A each rank among the top ten leading causes of death. In Africa about 350 million children and women suffer from deficiencies in vitamin A and iron, and Zimbabwe is no exception to the effects of micronutrient deficiencies and 'hidden hunger'. Results of a micronutrient survey in 1999 showed a 35.8% prevalence of vitamin A deficiency among young children (aged 12 -71 months) and 18% among schoolgoing children. The National Vitamin A Supplementation Programme was thus initiated in 2001. In 2002, with funding from the United Nations Children's Fund (UNICEF), vitamin A supplementation was integrated into the national immunisation days (NIDs) and the expanded programme on immunisation (EPI). [5,8] The 2003 national nutrition and EPI survey found that the vitamin A capsules distributed through the NIDs and EPI had reached only 46% of the targeted population. Worse still, the food and nutrition survey in 2004 observed that only 23% of assessed children had received vitamin A supplementation in the past 6 months. It was found that up to 90% of children in remote rural areas did not receive vitamin A supplementation. Support from Helen Keller International (HKI) then increased coverage in 2006 to 65% at the second dose through child health days and by taking advantage of integrated measles campaigns. HKI leadership and funding of the programme made it possible to have an extensive collaborative structure comprising the Ministry of Health, Community Welfare Department, the Nutrition Department (Ministry of Health), UNICEF, Rotary International, Plan International and other nongovernmental organisations as partners in the programme. With HKI pulling out in 2010, the vitamin A national supplementation coverage was again low, at 49%. This was attributed to several factors including economic changes in the country, challenges in government financial support and other inputs. The situation was made worse by an economic environment of hyperinflation and subsequent challenges that followed a change in currency to the US dollar. This left UNICEF as the main support partner together with the Ministry of Health sectors and required the formulation of additional strategies to bring about more sustainable vitamin A supplementation, and equip national staff to implement these strategies. Here we describe a successful vitamin A supplementation outreach strategy implemented in one of the remote rural districts in Zimbabwe, which increased coverage under the hard-to-reach circumstances of this remote rural region. The Gokwe-North District initiated and adapted a vitamin A supplementation outreach strategy within the national NIDs and EPI programme in 2011. This programme involved collaboration of departmental heads from different key government departments (Nursing, Nutrition, Health Education and Promotion, Administration and Accounting); their different responsibilities are listed in Table 1. These did not require specialised personnel in regions where staffing was a challenge; lower-level staff could be trained to carry out the different responsibilities. A nursing officer was responsible for the overall co-ordination of the programme. The key implementers in the programme were a team of EPI nurses, being a mix of registered general nurses and primary care nurses. The team, led by the nursing officer, designed a year-long EPI outreach schedule for routine vaccination and vitamin A supplementation (Tables 2 and 3). Outreach sites were determined in consultation with village health workers (VHWs) to ensure that even the furthest areas from the rural health centres (RHCs) were adequately covered. Part of the logistical planning of the outreach programme involved ordering vitamin A supplements from the provincial EPI department to the district, from where the teams distributed to their respective outreach sites. Each outreach site was visited once per month in the year. When funding was available for fuel and special district inventory, the district administrator would support the running of the programme. Two outreach teams were used for the whole district of population size 234 673 as per 2011. The two teams were strategically allocated to cover the eastern (E) and western (W) blocks of the district. Travelling distances to the supplementation sites totalled ~1 000 km of mostly rough gravel roads. Each team consisted of three EPI nurses responsible for supplementation, and a driver. These nurses were originally stationed in the largest EPI department of the district. The nurses were responsible for ensuring reach to those failing to obtain supplementation at their nearest RHC. A team would camp in the field for 5 days, and were supported with general supplies (food and general needs) from the district health services fund. In addition, in the year of the programme, UNICEF twice offered a small amount of funding to cover fuel and allowances. The allowances were calculated using prevailing government rates and were used to fund about 4 months' expenses. Accommodation for the team members was provided by the RHCs located close to the sites where outreach would be implemented. This was to ensure that no costs were incurred by the nurses and was a gesture of appreciation from the RHC for the commitment of the team in covering their catchment area. The teams would plan to carry out vitamin A supplementation at two different outreach sites per day as per the supplementation schedule (Tables 2 and 3); e.g. 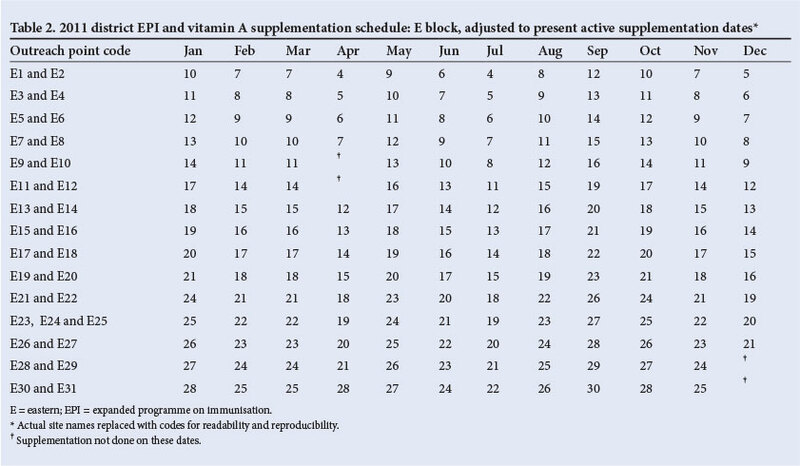 in the E block, sites E1 and E2 would be visited at different dates of the calendar month for all 12 months (Table 2). The demand for supplementation at these sites for the following months was initiated by the mobilising efforts of the VHWs. Within the communities, messages of the team's outreach efforts were spread to encourage those who had been missed to anticipate the next supplementation date. During the actual supplementation process the outreach team would make use of individual child health cards to check if the child was ready for supplementation and to avoid double/repeated doses. This process also facilitated the administration of outstanding immunisations, thereby influencing immunisation coverage positively. After every day's supplementation, a team leader would take time to update that day's statistics. This included compilation of the numbers supplemented at a particular point, supplements provided and any wastage. The nutritionist or any district executive member would do a follow-up supervision to verify the statistics and perform any other supervisory roles to support the outreach teams. A monthly consolidation of statistics was performed to address challenges for a particular month. VHWs were central to ensuring mobilisation at the community level for supplementation. This mobilisation was supported by an initial mobilisation before supplementation outreach under the responsibility of the health education and promotion officer (HEPO). Furthermore, the HEPO provided vitamin A supplementation brochures in vernacular and English, which the teams distributed to mothers and caregivers as take-home brochures. Based on the estimated district population of 234 673 for 2011, a total catchment population of 35 905 children aged 6 - 59 months was determined. Of these, 25 666 children aged 6 - 59 months (71%) were given vitamin A in the 12 months of supplementation in the district. Wastage levels were relatively low, with <10% being reported from the outreach supplementation programme. 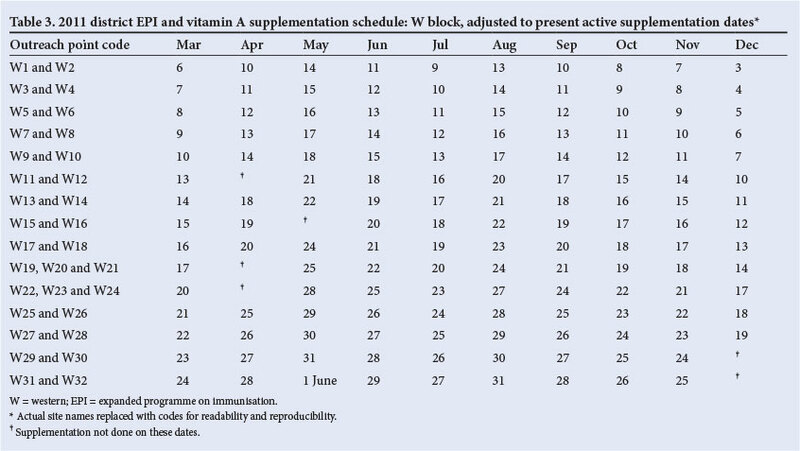 The 1-year vitamin A schedule was implemented in both the E and W blocks of the district (Tables 2 and 3). Challenges were faced at particular times, especially due to delays or limited resources (mainly fuel and food supplies). This resulted in the teams having to leave late for their designated sites and ultimately resulted in loss of supplementation in some children who would have been mobilised for a particular day. The other uncertainty that the teams faced was where a medical emergency would occur and the outreach vehicle would be used as the ambulance. This affected the movements of the teams. Having experienced these challenges, the team could address them through the provision of a budget at local level. Teams were affected by harsh weather conditions and this was felt most by the outreach programme that started in March for the W block (Table 3). During the summer rains, some areas became totally unreachable due to the poor state of roads. Despite the operational challenges faced and taking into consideration that the programme was in its initial stage, results indicate a potential strategy within the existing NIDs and EPI programme that can contribute towards ensuring the delivery of vitamin A in hard-to-reach areas such as the district in which we worked. In 2005, with a national coverage of 22.3%, the best coverage contribution of 50% was from an urban area. For rural areas a range of between 81.9% and 96.9% of children did not receive vitamin A in the previous 6 months. To provide a preventive dose every 6 months to children aged 6 - 59 months, the country followed varied strategies at different locations (urban and rural). Coverage was higher in urban areas as supplementation was relatively easier to implement. However, supplementation in rural areas presents a different scenario of hard-to-reach areas. Efforts to provide vitamin A supplements to remote rural regions are important, as children in these areas may be more vulnerable to morbidity and mortality. [12,14] Children under these types of circumstances have been reported to be born with negligible vitamin A stores while at the same time suffering frequent infections. In addition, they are also likely not to receive adequate vitamin A through breastmilk in the first 6 months of life, especially if the mother is malnourished. Efficient and effective delivery of vitamin A supplements would contribute to protecting children against increased vulnerability to vitamin A deficiency and its consequences. The involvement of the different stakeholders in the entire process from planning to implementation was useful. It is important to realise the importance of collaboration and consultation of provincial and district-level nutrition programmes in all the planning activities for vitamin A supplementation from the earliest moments. Furthermore, great emphasis must be placed on the need for continued support and motivation for the teams that will be physically involved in visiting the outreach teams. This can be in the form of department-to-department support structures, such as psychological rewards for the nurses and general celebrations for achieved goals/targets. Approaches such as these can support continued, sustainable motivation for the perpetual implementation of the strategy. This approach might also have had a positive effect on vaccination coverage; however, this is out of the scope of the current article and remains to be verified. A highly organised vitamin A supplementation outreach programme can contribute to enhanced coverage. In this instance, the adaptation of the supplementation process within existing structures resulted in a strategy with potential to improve coverage in hard-to-reach rural districts in Zimbabwe. We recommend further exploration of this strategy by others working under similar circumstances and motivate for its use in Scaling Up Member (SUN) states. We believe that if this strategy was to be well co-ordinated, it could result in full vitamin A supplementation coverage in several countries, such as seen in Guatemala (Solomon, personal communication). Acknowledgements. We acknowledge the work of all the staff involved in the 2011 EPI outreach programme, in particular Ms Mashabakure, the Gokwe-North District nursing officer who was the pioneer and overall co-ordinator thereof. We also acknowledge the work and support of the provincial nutritionist and provincial nursing officer. Support provided by partners operating in the district is also greatly appreciated. Lastly, our greatest acknowledgement goes to all the VHWs for committed efforts in mobilising and motivating communities to receive vitamin A supplements. Towards the implementation of this strategy in the Gokwe-North District, we acknowledge UNICEF for their generous financial support. We thank Sight and Life for funding presentation of this article at the International Conference on Food Security and Nutrition (ICFSN) 2013, Johannesburg, South Africa 29 - 30 April 2013.